AUT has a great infrastructure for research and study, says business alumna Dr Paweena Wanchai who completed a PhD in business information systems. “It was very helpful to conduct my PhD research in an environment where the university provides you with all the needed resources – from seminars to discuss the research progress to well-resourced libraries, laboratories and classrooms, and helpful supervisors and staff. The decision to come to AUT was an easy one, says Paweena who came to AUT as an international student from Thailand. 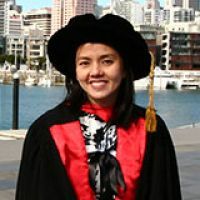 “I was working as a lecturer in information technology at Khon Kaen University in Thailand, and holding a doctoral degree is a must for this position and to further my academic career. When I was considering doctoral study, I wanted to have an international experience and study at a great university. Studying in a different country had some challenges, she admits. For her PhD research, Paweena focused on complex mandatory information systems. “The introduction of a complex system, for example an enterprise resource planning system, requires users to adapt to the requirements of the new system and the associated organisational and business process changes. She appreciated the support of her supervisors, says Paweena whose PhD thesis was supervised by Associate Professor Antonio Díaz Andrade and Associate Professor Angsana Techatassanasoontorn.